Make this quick, simple robot that can operate in as large of a range as your network provider's coverage area. Hello World! 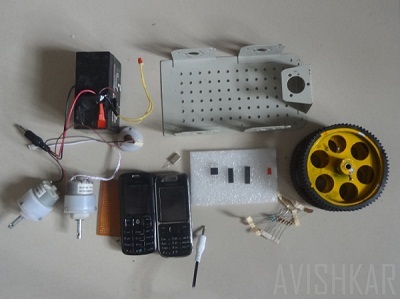 In this post I will be showing you how to make a cellphone controlled robot. Controlling a robot using a cellphone is not as complicated as you might think. 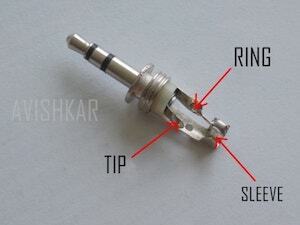 It is a very simple project that you can make with a few components and in very little time. This robot has the advantage of range as the controlling range of the mobile controlled robot is as large as the coverage area of the network provider. In this post, I will be making the mobile controlled robot using the 1st method (without Micro controllers). 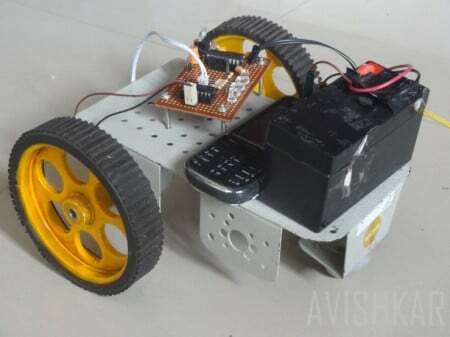 How Does the Mobile Phone-Controlled Robot Work? The robot is controlled by a cellphone that makes a call to a second cellphone that is attached to the bot. When any key is pressed on the controlling phone, while the phones are connected on call, a tone corresponding to the key is heard at the receiving end of the call. This tone is called a Dual Tone Multi Frequency (DTMF). When the mobile robot receives this DTMF tone through the phone, the tone is accepted through the DTMF decoder MT8870 IC. This IC decodes the DTMF tone to its equivalent binary digit and this binary number is sent to the motor driver L293D. The decision for movement of the mobile robot is then taken by the Motor Driver. This controls the geared motors accordingly to provide forward, backward, left or right motions. You can use the table for understanding the controls of the robot. Solder the IC7805 (Voltage Regulator) to the perfboard and place a 10 µF capacitor with its legs at the INPUT & GND pins of IC 7805. Place another 10µF capacitor between the GND & OUTPUT of IC7805. Take the positive supply from the battery and connect it to INPUT of IC 7805. Also connect its negative supply to GND. You will receive 5V supply at the output pin. To verify the power flow, connect an LED to the output pin via a 1K resistor. Solder the DTMF Decoder IC on the perfboard & connect the legs of 3.57Mhz crystal to Pin 7 and 8. Solder a 100K resistor from Pin 3 to Pin 2. Connect one end of another 100K resistor to Pin 3 and the other end to a 0.1µf ceramic capacitor. Leave the connection of other end of the ceramic capacitor free. 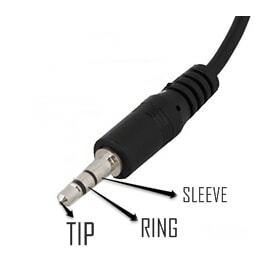 I will discuss it in a later step (3.5mm Audio Jack Connection). Join Pin 1 and Pin 4 together. Join Pin 5, Pin 6 and Pin 9 together and connect it to GND. Pins 11, 12, 13, 14 are the output pins of the DTMF Decoder which are to be connected to the Pins 15, 10, 7, 2 of the Motor driver IC L293D, respectively. 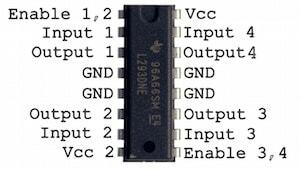 Provide 5v supply to Pins 1, 9 and 16 of L293D. Pin 8 is given the voltage(12V) for the Motors, so it is connected to INPUT of IC7805. Pins 4, 5, 12 and 13 are to connected to GND. Connect terminals of one motor to Pins 3 and 6 (Output 1) and terminals of the other motor to Pins 11 and 14. There are three different layers for the 3.5mm audio jack. These are the Tip, Ring and Sleeve. The tip and ring are connected to the GND. 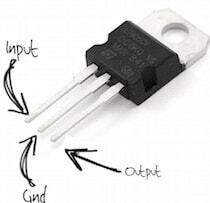 In the DTMF Decoder IC circuit section, we had left the connection of a 0.1µf ceramic capacitor which is to be connected to the sleeve. You can check the pictures given below for further clarification.